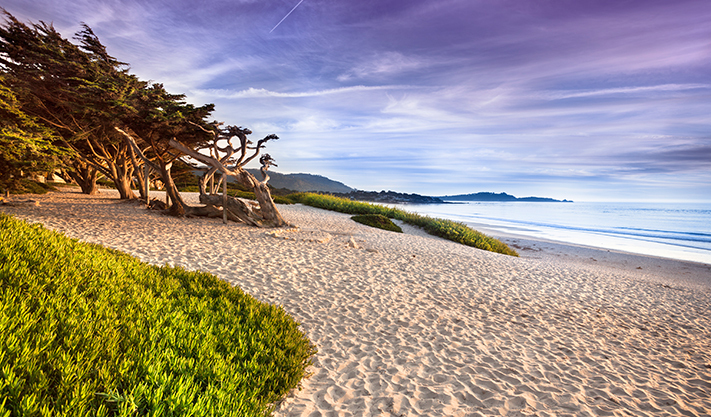 Rated "One of America's Top Beach Towns," Carmel Beach is one of the most iconic spots on California's Central Coast. 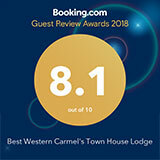 Whether strolling along the Scenic Bluff Path to Carmel River Beach or just enjoying the pristine beach conditions and warm, sunny weather, Carmel Beach offers picturesque views filled with outdoor recreation. Learn how to catch a wave with surfing lessons or stay on land and compete in the Sand Castle contest. Play a match of beach volleyball or gaze out to the crystal-clear water and watch the dolphins jump. Carmel Beach is one of the few California beaches that allow alcohol and dogs off-leash, so pack up the cooler and the pups and stay the day. When the sun goes down, Carmel Beach lights up with smoky bonfires along the sand. Gather with friends and enjoy a perfect sunset right on California's coast. Hours - Open daily from 6:00am to 10:00pm. What are the best things to do on Carmel Beach? Known for its white sand and scenic paths, Carmel Beach is a great place to enjoy California's sunshine and outdoor recreation. Relax on the sand, surf, play beach volleyball, watch dolphins swim, and frolic with pups on this beautiful, dog-friendly beach. After the sun goes down, gather with friends for a cozy beach bonfire. Can you have a bonfire on Carmel Beach? Yes! Beach bonfires are allowed on Carmel Beach. A fun way to enjoy the beach after dark, bonfires do come with a set of rules in order to protect the environment. Beach fires are allowed from 4 pm to 10 pm daily and must be south of 10th Avenue in the Beach Fire Zone. No fires are allowed to be built directly on the sand. Carmel Beach is one of the few beaches in California that allow alcohol, so pack a cooler and enjoy the views.